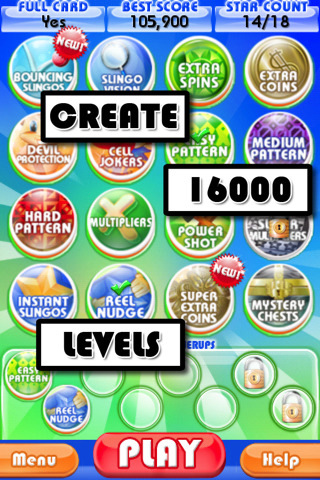 Slingo Supreme is an iPhone game by Funkitron which is a mix of slots and bingo. This app is more focused on playing slots then bingo since the numbers generated are not so random. If you like playing slots with a twist to it then you’ll enjoy Slingo Supreme. This game is easy to pick up but hard to complete due to the awards and high score. You can select Supreme mode first but after a game you can play Classic mode and the daily challenge. In Classic, you cannot use any abilities you have earned. For the daily challenge, abilities are different depending on the challenge. As for Supreme, you start out with one ability and you’ll earn more as you play. Also, Supreme mode is the only place where you can choose your abilities. When a game starts, you tap the spin lever to make five random numbers appear and try to see if you can match any of those numbers to the above twenty five slots. The numbers on the bottom may repeat but you can also get random things to happen for good or for worse. Jokers allow you to match of any five of the above squares. Super Jokers are even better, they allow you to match any square that was not picked already. A devil may appear to challenge you for your points. You have to wage either all, half, or a quarter of your points. Devil challenges are either hard or easy. A hard challenge is pick a card out of five and try to get a higher number. An easy one would be the three cups just keep track of where the cherub is and you can get a double your score. Points are gained through matching slingos which is basically a bingo and getting a full card allows you to gain a nice amount of points. The controls are somewhat responsive. Sometimes this app will lag or will quit on you. Slingo Supreme does not have any online features. Despite all this, Slingo Supreme is a fun game. The graphics are cartoony but polished with a nice variety of colors. Slingo Supreme provides a good lesson for people who do not know anything about the game. They direct you to what is important and what does what. I just wish they have an index so I can look things up if I forget something like what certain abilities do. Due to how many things can happen on screen, I assume this is where most of the lag comes from. Slingo Supreme’s graphics are not the most detailed but they are polished and detailed. The music for this app reminds me of when I use to go to carnivals when they came to town. It is repetitive but I hope they will include a way for us to play our own music in future updates. The sound effects fit the game perfectly. There are clinking effects from the randomized slots while coin squares getting matched or randomized sound like you have won some cash. The sound effects from your abilities give a whimsical vibe to the game. Overall the audio is amusing but can be repetitive for some people. Slingo Supreme is priced at $0.99 on iTunes. This game is a pick up an play type of game since even if you lose you win. There is no real drawback in losing since whatever you have done adds to your records to unlock stars (needed for using powers) and slots (space to add an new ability). The only thing you have to be careful of is completing an award since those take a long time to do. I have yet to complete the unslingo award which is to fill up twenty spaces on a card while not making a slingo at all. My record for that award at the moment is nineteen. So close, yet so far. Oh well, this game is quite addicting and once you start you can’t stop. I hope Funkitron will fix the lag problems, the random crashes, add some new abilities and maybe even a leadersboard feature. Overall, I think Slingo Supreme is a great app that mixes two worlds together and also have an identity on its own. 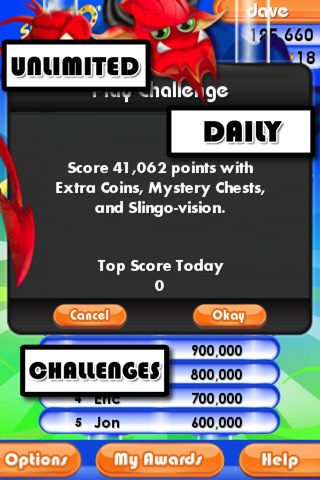 AppSafari review of Slingo Supreme was written by Tony Lau on February 28th, 2011 and categorized under App Store, Board, Games, Puzzler. Page viewed 3847 times, 1 so far today. Need help on using these apps? Please read the Help Page.